Tristan und Isolde, Bayreuth 2015: Christa Mayer (Brangäne), Evelyn Herlitzius (Isolde), Iain Paterson (Kurwenal) and Stephen Gould (Tristan). Following her controversial direction of Die Meistersinger in Bayreuth 2007, stakes were high when Katharina Wagner set her sights on directing a new Tristan und Isolde for the 150th anniversary of the work’s world premiere. She is clearly very much aware that with her contract up for renewal her future role as Festival Director of the Wagner festival is under evaluation. With this impressive new Tristan, so different from her somewhat bizarre and bluntly provocative Meistersinger, I would think that her chances of retaining her position are certainly not diminished. The Wagner Festival in Bayreuth has seen some changes during the years since Katharina assumed leadership together with her half-sister, Eva Wagner-Pasquier, in 2008. This was the year their father, Wolfgang Wagner, finally decided to retire after 57 years at the helm. He left a solid foundation, a substantial artistic network and a remarkable tradition for his two daughters to carry forward. However, Wolfgang had suffered much criticism from certain quarters for his reluctance to cast light on the darker episodes of Bayreuth’s political history. Katharina, however, has not been one to shy away from a forthright exposition of the Wagner Festival’s controversial past. Not only did she have the courage to present it on stage in her aforementioned Meistersinger - albeit in an aesthetically questionable form - but also in the form of a permanent exhibition on the fate of Jewish musicians in Bayreuth under Cosima and Winifred. This was installed in the park just in front of the festival building during the Richard Wagner bicentennial in 2013. Furthermore, the museum at the Wagner house Wahnfried was finally reopened to the public this summer, together with the first floor of Wieland’s villa next door. A completely new wing housing a richly documented history of the Wagner family at Wahnfried has been built alongside the garden, showing how family members became entangled with Hitler and the Nazi administration in the decades leading up to 1944. The telling of this story is long overdue – not elsewhere in Europe, but in Bayreuth itself. It would seem that a shift of generation was needed to realize this re-historization of the Festival. However, the Wahnfried museum exhibits much more than this. In the basement of the house, visitors have the valuable opportunity to hear selected excerpts from Wagner’s music, accompanied by an elegant, electronic unfolding of the scores depicting the orchestration and the use of Leitmotifs throughout the musical process. There is indeed much more to the history of the Wagner family than Hitler and the Nazis. Meanwhile, in September 2015, Eva left her top position at the Festival, to continue only as an advisor to her younger half-sister. As conductor for her new Tristan, Katharina has chosen Christian Thielemann, known as a man of conservative tastes and traditional musical leanings. While his ardent followers imagine him a contemporary Wilhelm Furtwängler, others prefer to see him as an embodiment of Minerva’s Owl, famously flying backwards into the future with its gaze directed firmly towards the past. Having worked regularly at the Green Hill since 2000, there was some amusement earlier this year when it was noticed that Thielemann’s parking space was suddenly furnished with the signpost, ”Music Director.” Only later was his new position officially announced, a position which largely encompasses Eva’s casting responsibilities. Indeed with four weeks to go before the premiere, Thielemann’s replacement of Anja Kampe with Evelyn Herlitzius as Isolde was the cause of another minor uproar. While the conductor referred to the need to match the vocal force of Stephen Gould as Tristan, others suspected that he might have an issue with Kampe herself. Christian Thielemann conducts Tristan with an extraordinary sensitivity and smoothness of articulation. Under his baton the orchestral timbre is remarkably unified and centred, in a manner that is scarcely possible in houses other than Bayreuth. His playing is clearly expressive, but he also holds back, creating a fascinating mixture of emotional distance and seduction. Starting out very quietly in the first bars, he allows the orchestral body to gradually swell into the symphonic waves that ensue, one after the other, building towards the dark and lucid climax on an inverted ”Tristan chord” towards the end of the 11-minute orchestral prelude. The musical stage is magnificently settled when the curtain rises to a scene that is completely different. And what a stage picture! 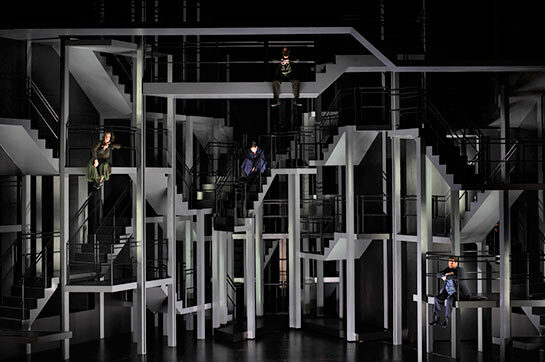 A vertical maze of barriers, terraces, staircases and elevators constantly being closed off or blocked effectively conjures up the social and psychological impossibility for Isolde and Tristan to reach each other during the First Act. The construction, where the protagonists hopelessly chase each other, evokes the “impossible” labyrinths of M.C. Escher. Moreover, the stiff constructions in steely black present a visually striking contradiction to the organic stream of orchestral music. One thinks of the similar contrasting effect created by Erich Wonder’s static, cubistic stage pictures in Heiner Müller’s Bayreuth Tristan back in 1993. The violent labyrinth of physical disjunction becomes an allegory of the inner contradictions in Tristan and Isolde’s feelings, not to mention their intertwined and impossible fates. In Katharina’s interpretation, their mutual love is exposed from the outset. Hence, they have no need for a love or death potion, which they never drink, but instead pour on the ground in a gesture of deep significance. In the Second Act, a veritable prison in black or, rather, a torture chamber, replaces the green garden of nightly love. Featuring searchlights on the top of the walls, Isolde and Brangäne are kept under constant surveillance by King Marke and his men. In fact, the King’s men effectively throw Tristan and Kurwenal into the prison, in order to monitor their behaviour. 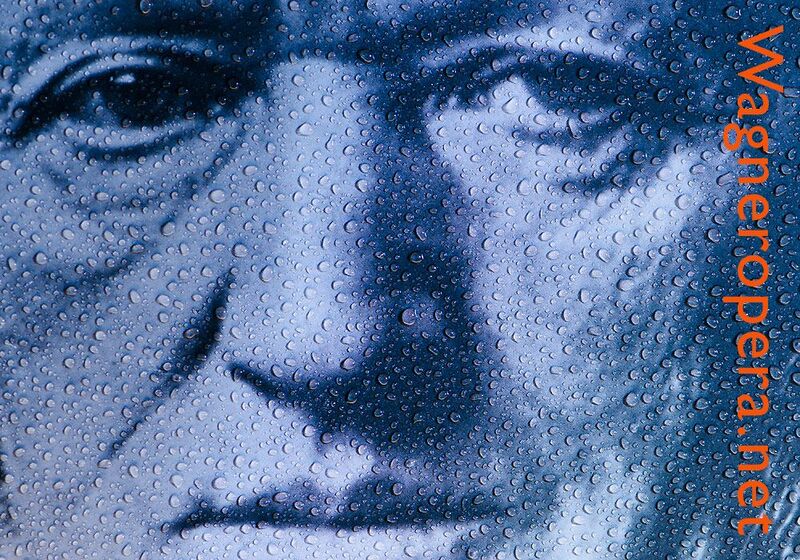 Thus ensues a lengthy reinterpretation of Wagner’s work, challenging the text itself. When Tristan cries, for instance, “The light, the light! …how long before it was put out”, it is not Isolde’s torch but the beam of the search light from his prosecutors that shines in his face. Hence, the role of the King is changed, from being a passive victim of his young wife’s adultery to being actively involved in the fatal dramatic development. This offers a new interpretation of the Tristan drama. When the loving couple are finally revealed and disgraced, King Marke’s long lament takes on new meaning. His actions may appear squarely contradictory to his words, but I would suggest that his motivations are of an unfathomably complex nature. By removing the love potion from the plot, Katharina’s direction shows, on the one hand, little taste for the romantic and supernatural elements of the story. Royal prerogative becomes outright persecution and violence. There are few traces of the wise old king and mentor who shows loving compassion for his nephew: the blindfolded Tristan ends up on his knees as Melot – somewhat ambivalently - coldly stabs him in the chest on the orders of the King. While, on the other hand, at the climax of the love duet, the two lovers, still trapped in their prison cell, see themselves together in a religious vision. They are floating away through a tunnel that that leads beyond the walls of their imprisoned and miserable lives, bringing relief and leading them to the other side of death. Brangäne’s thrilling watchtower episode, “Einsam wachend in der Nacht” is sung with such vocal conviction that she floats effortlessly over the full orchestra, even though at this point Christa Mayer sings off-stage. Iain Paterson gives a fine performance as Kurwenal and Georg Zeppenfeld shows great vocal authority as Marke. The Second Act ends with the King brusquely dragging Isolde off the stage as if she were his property, an action that is repeated at the very end of the opera. And with feminist political undertones, the violence of the forced marriage is underlined. In the Third Act, the potential for lighting effects in Bayreuth is realised to its full effect. The covered orchestra pit casts no light on the stage making possible the complete invisibility of actors. Tristan’s delirium is magnificently rendered with visual effects that feature the sudden apparition and disappearance of Isolde, behind him, high above, or to one side or the other. She always appears inside a triangle or a tetrahedron of light, eerily waving at him. In desperation, he crawls to her, only to be left holding a pile of empty clothes. As a phantom, she can never be embraced. The next time he touches her she is suddenly covered with blood, and later again her head horrifically falls off. Tristan’s psychological breakdown into near madness is twisted into genuine horror. A performative paradox arises when Stephen Gould sings of his exasperation in a voice that is almost too strong and healthy, too beautiful and secure to match the theatrical context. Conversely, Evelyn Herlitzius’s final monologue, the so-called “Liebestod” (or in Wagner’s own term, “Isoldens Verklärung” or transfiguration), is sung with a palpable lack of lyricism, emphasizing instead the ultimate defeat of love and redemption. As a conclusive theatrical gesture, while the orchestra pours out the final sound, the B natural major chord in what has been called ”the world’s most beautiful orchestration”, the King grabs Isolde by the hand and tears her away from her dead lover’s body and off the stage. Brangäne remains alone between the dead bodies as the curtain falls. In sum, this is a dark, rather depressing Tristan, although unerringly consistent and coherent from beginning to end. The new associations between the word and the deed, music and scene contribute to a new reading of the drama, something not often experienced on operatic stages these days. Bayreuth has again positioned itself as the centre of contemporary opera production. After such an artistic triumph, the future of the production and Katharina Wagner’s credibility as an opera director – and a festival director – is likely to survive for a long time. Erling E. Guldbrandsen is professor at the Department of Musicology, University of Oslo since 2004. He has published widely on Wagner, Bruckner, Mahler, J.S. Bach, Pierre Boulez and musical modernism, on Norwegian opera after Wagner, and on music history, contemporary music, aesthetics and performance studies. His most recent publication on Wagner is “Staging the King. Readings of Wagner’s Tristan” (in Studia Musicologica Norvegica 41, Oslo: Universitetsforlaget 2015). His next book, Transformations of Musical Modernism, which he is co-editing with prof. Julian Johnson at the University of London, Royal Holloway, is forthcoming on Cambridge University Press in 2015. Guldbrandsen also works as a music critic (for the Norwegian Broadcasting Corp. and for the weekly paper, Morgenbladet) and he has covered the Richard Wagner Festival in Bayreuth since the 1990s. For his recension of Lohengrin (performed at the Norwegian national opera in March 2015) he received the award, “Critique of the year”.